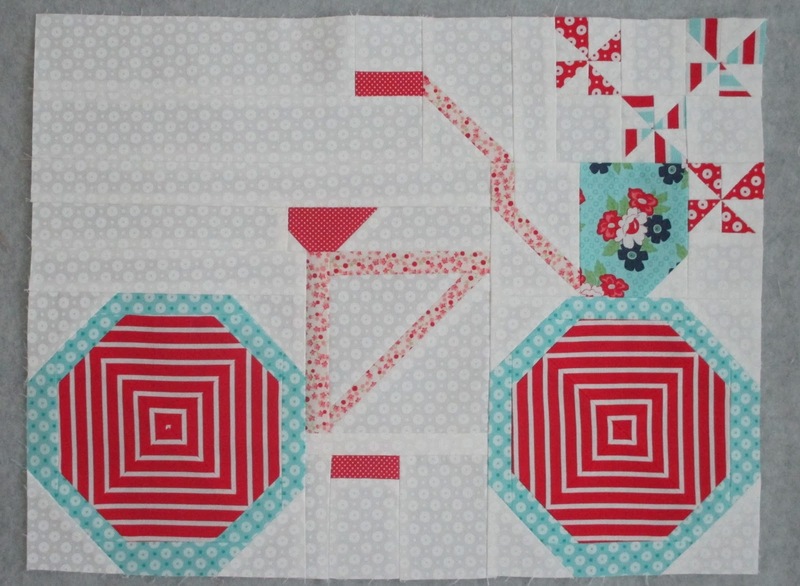 This month's block is Like Riding a Bike, my latest favorite. I used Daysail fabric, but chose different prints than what is listed in the pattern. This block took twice as long as the rest of the blocks I've pieced so far, it has nearly 80 pieces. It's not hard, but don't think you'll finish it up in a couple of hours, you'll need a long afternoon if you plan to make it start to finish. Maybe cutting the pieces one day and piecing it the next would be a good plan if you're rushed for time. But either way, it's time well spent, I think this bike is too cute for words. 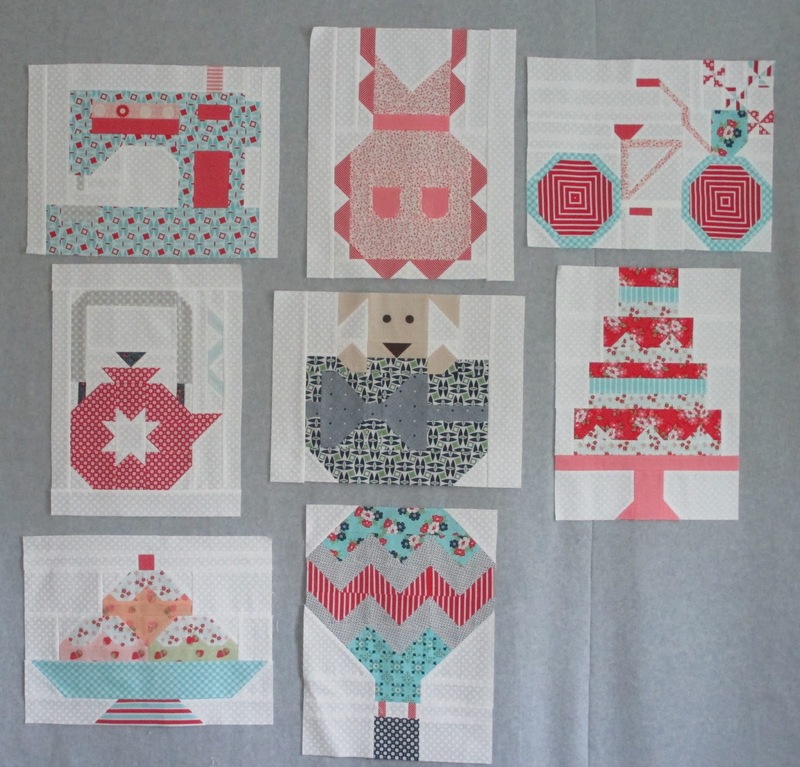 I've not shared a picture of all my blocks in ages, so here they are. Note to self, use more navy blue in future blocks! I am thrilled that the FQS has already surpassed it's initial goal of raising $10,000 for St. Jude Children's Research Hospital and its new goal of $20,000. The last time I checked the amount raised was over $29,500, we're so close to $30,000, how great is that! As a reminder, the monthly patterns are a free download, a donation is up to you, the suggested donation is $5. Here is a link to the pattern, instructional video, donation page, and everything else you need to know. (click here) The backing and finishing directions are also now available. Here are a few more folks participating in the sew along, be sure to check out their bikes. And finally, check out instagram, #fqssnapshots for some great blocks and inspiration. Last month someone put a Paris cityscape print in the lens of their camera block that was amazing! Why didn't I think of that!! This is so cute. Love the fabric you put on your wheels. They really look like spokes! Very cool block... love your wheels! 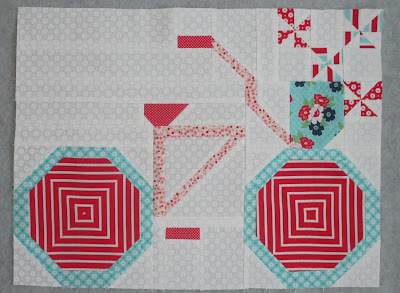 I've gone back and forth on whether or not to make this, but your spokes have made the decision...love this Thelma! 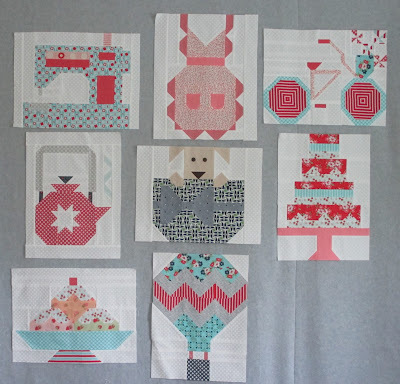 I love all your blocks together, Thelma! They look awesome. Looks great! Your wheels are very hypnotic. I need to catch up on couple earlier ones and then I will be biking. All your blocks together look awesome!